What's the fastest way to rip ~300 CDs? Is it one of those ridiculously over-priced robotic CD arms that loads a spool of CDs into a single CD ROM drive one at a time? Only if you are a fool. I have a better tool for the job. Rip 7 at once. Rip them as raw audio files at the Drive's maximum speeds. Then as a separate independent parallel process, encode the ripped audio into compressed formats (.mp3 or .m4a etc). 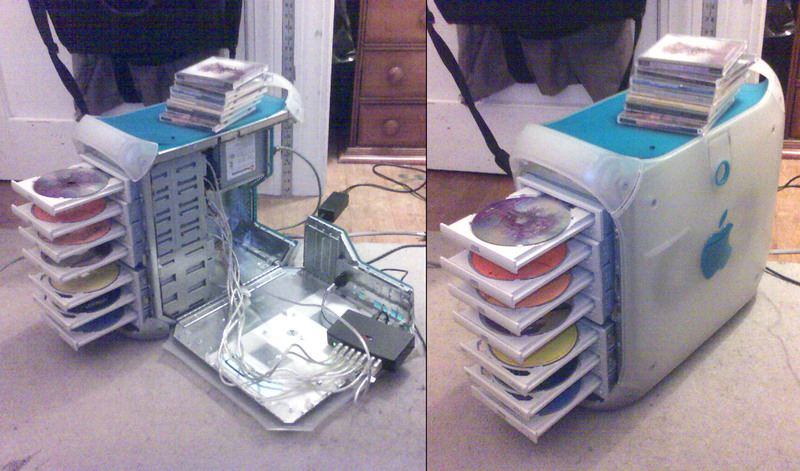 This awesome Drive Tower of mine started it's life as a Power Tower Pro with 2 CD Rom drives in it. Once I discovered a method for ripping from all drives at once, I filled it out to 4 CD Drives. I wanted more, so I took an old PC Tower and removed the metal caging for it's 3 optical drives and riveted it into the Power Tower Pro , so it had all 7 CD Rom Drives. This was all good and swell, but the Power Tower Pro case is a really ugly tower, and it's really not made to be moved easily. Plus its way too huge. Thats when one of my old Blue & White G3's caught my eye. Its much smaller, and has these great built in handles so I can move it around really easily. So I got to cutting again, followed by some more riveting :-) And when I was done, I had this crazy CD Ripping machine.